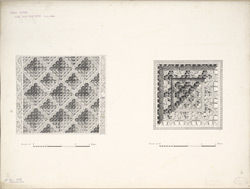 Illustration of the ceiling panels above the mihrab of the Hilal Khan Qazi mosque at Dholka in Gujarat from James Burgess' 'Original Drawings [of] Muhammadan Architecture in Gujarat.' The Hilal Khan Qazi mosque (inscribed Balal Khan Kazi), located 23 miles southwest of Ahmadabad was constructed in 1333 by Hilal Khan Qazi. The mosque and courtyard occupies an area of 147 by 142 feet. The mosque, situated on the west side, only takes up a fraction of the depth by 35 feet. The interior space is structured into five bays with five corresponding low conical domes, each supported by eight pillars. Accentuating the central area, the centre dome supported by a second level of pillars, raising it an additional seven feet. The north section of the mosque is separated by a perforated partition to be used by women. Originally, there were five mihrabs or prayer niches, and the three in the centre section were supported from the exterior by buttresses. The central mihrab is composed of sculptured marble, and the ceiling panel in front of the prayer niche is decorated with small carved domes with a spiral pattern.